On 14 June, 2003, the Dr. Rath Health Foundation submitted a formal Complaint to the International Criminal Court (ICC) in The Hague. A 36-page document, the Complaint detailed genocide and other crimes against humanity committed in connection with the pharmaceutical business with disease and the Iraq War. As we statedat the time, the charges brought before the ICC concern crimes that are among the worst committed in human history. Despite their shocking gravity, however, George Bush and Tony Blair, the chief perpetrators named in the Complaint, have thus far managed to evade justice. In the case of Bush, given that the United States is not a party to the statute that established the ICC, a case against him currently seems unlikely. As for Blair, however, while he still retains formidable political influence, the campaign to send him to The Hague is growing and is far from over. The charges contained in our Complaint relate to two main fields of crime. The first of these involves crimes perpetrated by the drug industry, which include genocide and other crimes against humanity. The second involves crimes relating to the 2003 Iraq War and the international escalation towards a Third World War. The charges in this section relate to crimes of war and aggression, as well as other crimes against humanity. The two fields of crime cited in the Complaint are directly connected because they have each been committed in the interests of the same corporate investment groups and political stakeholders. For this reason, those accused by us include individuals from the field of politics; companies from the pharmaceutical, petrochemical and financial sectors; corporate lobbyists and other interest groups; members of the international media; plus other groups and individuals. While the ICC was unwilling to initiate an investigation against the accused in 2003, the pressure for Blair and Bush to be held to account has continued to mount worldwide. In 2009, responding to growing pressure, the then British Prime Minister Gordon Brown announced that an inquiry would be conducted to identify lessons that could be learned from the Iraq War. 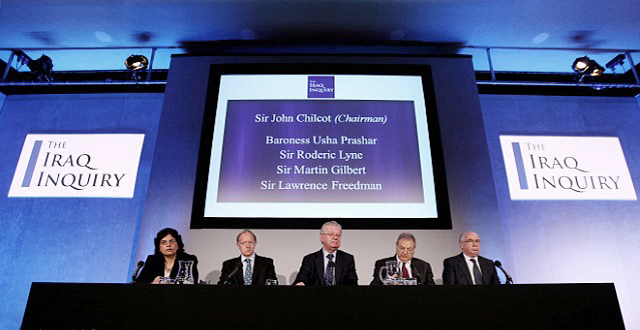 Sir John Chilcot, a British Privy Counsellor and former civil servant, was appointed as Chair of the inquiry, with the first round of hearings beginning in autumn 2009. The hearings continued for a period of almost two years, eventually concluding in 2011. The written evidence studied by the Inquiry included over 150,000 documents. 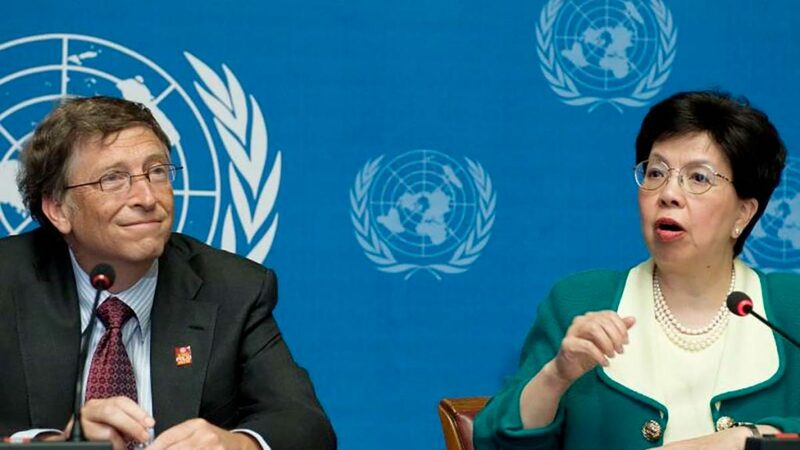 After several years during which protracted negotiations took place over references to classified material, the final 2.6 million word report was eventually released on 6 July, 2016. So far as the involvement of Tony Blair is concerned, the report is utterly damning. Among other things, it found that he deliberately exaggerated the threat posed by Saddam Hussein; that he had promised George Bush he would be with him “whatever”; that his cabinet’s decision to launch the invasion was made in circumstances that were “far from satisfactory”; and that he deliberately ignored warnings on what would happen in Iraq after the invasion. The devastation and chaos that have since enveloped the Middle East, as well as the consequences both in Europe and worldwide, bear testimony to the sheer recklessness of these decisions. Perhaps most damningly of all, with estimates suggesting that up to 1.2 million people may have lost their lives as a result of the war, the report accuses Blair and his government of devoting more time to which department should have responsibility for determining the body count than they did to ascertaining the actual number of fatalities. Seemingly, their main interest was to “rebut accusations that coalition forces were responsible for the deaths of large numbers” of Iraqi people. Following the publication of the report and its findings, families of British killed in Iraq are now planning to sue Blair. Disgracefully, however, British taxpayers will be obliged to pay the former prime minister’s legal costs and any damages that might result from the case. 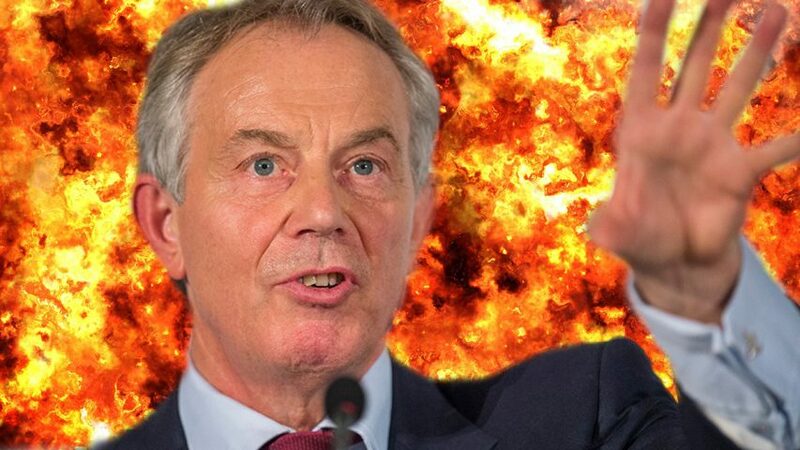 A recently released feature-length documentary, The Killing$ of Tony Blair, promises to heap further public shame and international pressure on Blair. Co-written and presented by British politician and broadcaster George Galloway, the film examines Blair’s prime-ministerial career and describes how his business activities since leaving office have included consulting forgovernments with highly questionable human rights records. Showing how, in return for this, Blair has been lavishly rewarded and achieved staggering personal wealth, Galloway suggests that his decisions while in office were influenced by knowing how he would earn a living once he stood down as prime minister. Revealing the shocking reality about Blair’s deadly decision to join George Bush in the invasion of Iraq, and identifying that their joint actions constituted one of the worst crimes of the century, the film essentially echoes the same conclusions that we ourselves reached in our 2003 ICC Complaint. As George Galloway has pointed out, the Iraq War effectively amounts to a coup carried out under the cover of democracy. Despite the fact that, in the run up to the war, around one million people marched in London to protest against it, the fact is that the atrocities carried out under Blair’s leadership were still deliberately perpetrated in their name. From a British perspective, the war was fought by a military flying the British flag, paid for with British taxpayers’ money, and authorized by the British Parliament. So what should we make of Blair’s recent return to the political scene and insistence that Brexit can be stopped? Given his close connections to the pro-Brussels EU ruling elite, his corporate paymasters, as well as his friends in the mass media, there can be absolutely no doubt whose interests he really represents. Deep down, however, having already been found guilty of committing crimes against peace, crimes against humanity, and genocide by a Malaysian tribunal, Blair will be aware that the number of people seeking for him to be brought to justice is growing larger with each passing day. As we said back in 2003 upon lodging our Complaint at the ICC, both he, Bush and the others accused by us know they will one day be held to account for their crimes. So long as they remain at large, our Foundation stands in close solidarity with those who seek justice for the countless numbers that have suffered and died as a result of their actions.